This is so huge I can barely believe it but once again, all of our hard work is paying off yes? Although our government is moving slowly to protect consumers, including the youngest and oldest among us, private industry is taking action but there is still much work to do. Over the last six months, the Ecology Center researchers tested 65 flooring tiles for phthalates that have been linked to asthma, birth defects, learning disabilities, reproductive problems, liver toxicity, and cancer. The flooring tiles were sampled from five national flooring retailers: Ace Hardware, build.com, Lowe's, Lumber Liquidators, and Menards. Samples were acquired from retailers in seven different states: Connecticut, Massachusetts, Maine, Michigan, North Carolina, New York and Vermont. 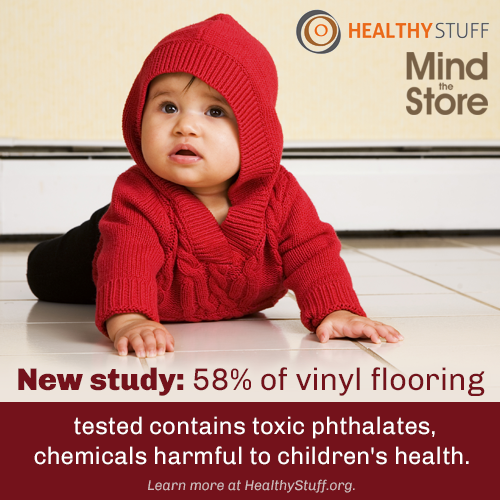 This new study found that most vinyl flooring tested contained toxic phthalates, a number of which have been banned in children’s products since 2009. Phthalates are commonly found in flooring at levels which exceed U.S. Consumer Products Safety Commission (CPSC) children’s product standards for phthalates. The study also surveyed major retailers to assess whether they have adopted policies to eliminate phthalates in flooring. The survey found that The Home Depot is far ahead of its competitors by requiring its suppliers to eliminate ortho-phthalates in all virgin vinyl flooring by the end of 2015. The company has been working with the Safer Chemicals, Healthy Families “Mind the Store” campaign to develop this policy since the spring of 2014. The study is part of ongoing research at HealthyStuff.org (a project of the Michigan-based nonprofit organization, the Ecology Center) on harmful chemicals in consumer products and co-released with Mind the Store. • Among flooring brands, Armstrong and Designer’s Image stood out for having zero of tested tiles with phthalates in the surface layer. The study allows consumers to identify phthalate-free options. Also, many of the retailers surveyed sell non-vinyl flooring alternatives. Healthier flooring options included bio-based linoleum, natural rubber, bamboo and ceramic tile. A growing body of credible scientific evidence has linked exposure to phthalates to serious threats to human health including asthma, harm to male reproductive organs, brain development, and the immune system. For full study results and detailed information about what consumers can do visit HealthyStuff.org and please TAKE ACTION TODAY: Tell Lowe’s to eliminate toxic phthalates in flooring by clicking HERE! Yeah, I totally disapprove vinyl floor. You can check reviews of tailoredessays.com for further testing on why this is dangerous to kids.